Two new winners stood atop the podium after an incredible finals day for the fourth round of the Rotax Pro Tour at Sydney’s Eastern Creek International Karting Raceway this afternoon, while several class leaders have their eyes firmly on the World Finals in Brazil come the end of November. Lucas Lichtenberger (Rotax Light) and Lucas Ward (DD2) took their first wins in their respective classes, while World Champion Troy Woolston (DD2 Masters), Jaiden Pope (Junior Max), Costa Toparis (Mini Max) and Jake Rutkowski extended their Conquer the Worlds points leads and Lane Moore (Rotax Heavy) took a resounding win in Rotax Heavy. 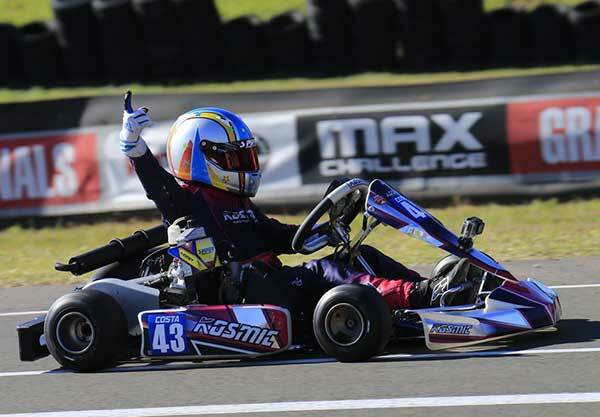 Sydney-sider and North Shore Kart Club local, Lucas Lichtenberger made a return to the Pro Tour this weekend in Rotax Light and duly set about sticking it to 40 of Australasia’s best. After pole and two race wins yesterday, he was the big winner after a high stakes six kart freight train duked it out for the race win. After Cameron Longmore led away from the pole, Reece Cohen – who was second on points coming into the weekend – made a daring pass for the lead. This brought Lichtenberger into the picture from third and from there, numerous lead changes and races among the top three emerged – with the likes of Leigh Nicolaou and Ben Jurczak joining the fray. 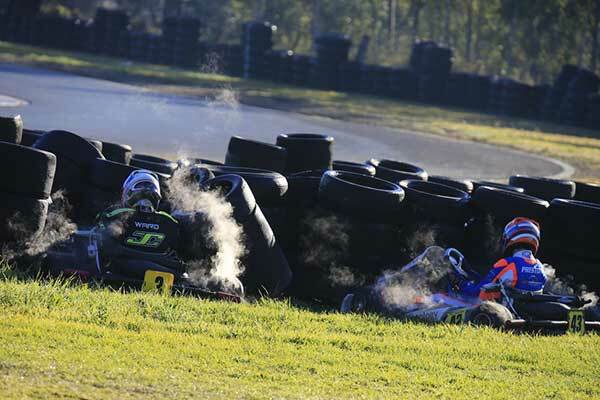 The pair of 16-year-olds, Lichtenberger and Cohen swapped the lead on numerous occasions with Cohen also having in the back of his mind Rotax Max Grand Final Challenge qualifications – particularly with Series leader Josh Hart running at the back of the field. 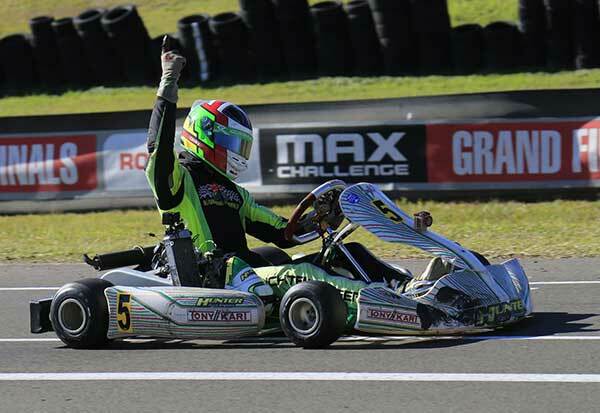 In the end, Lichtenberger claimed his first ever Rotax Pro Tour Rotax Light victory from Cohen and from Jurczak – who won a Junior Australian Title on the 1024m Eastern Creek layout 11 years ago. Longmore was fourth, while Nicolaou kept himself in contention with a fifth placing. Round one winner, Brodie Whitmore chipped forward from a disastrous qualifying yesterday to finish in sixth position. Lucas Ward started last in the DD2 final and moved his way forward to be in contention through an insane opening stanza of the race which eliminated frontrunners Ryan Kennedy, Nathan Tigani, Kody Garland and Josh Drysdale in the first handful of laps. Newcomer from the Tom Williamson Motorsport stable, Kiwi Josh Bethune was at the front of the race with a number of drivers from the beginning. Ward joined the party and the two began duking it out. 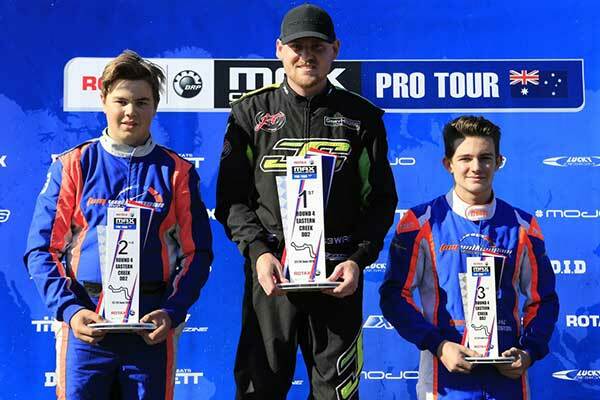 Neither expected a charge from 15-year-old Jac Preston – who made the final by mere seconds after getting behind the wheel of a borrowed chassis without having time to dial his own setup into it. Preston staged the race of his young career to get to the front and eventually to the lead past Bethune and Ward and ultimately crossed the line first, but a post race bodywork penalty dropped him to third. 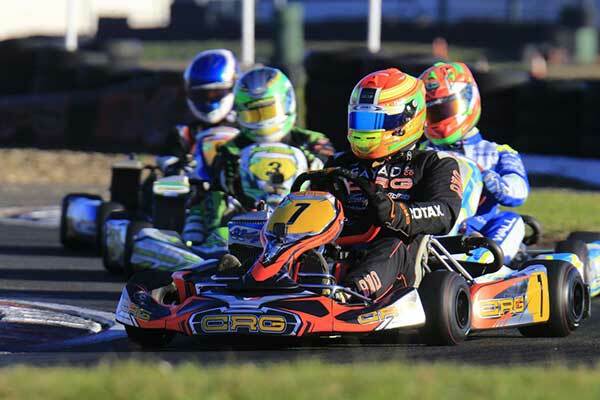 It was the first DD2 Pro Tour win for JT Motorsport JC Kart driver Ward – and the perfect way to get his run to Brazil underway – with the Rotax Rankings points re-setting at the start of this round for the second DD2 seat. If Troy Woolston wasn’t already on target to successfully defend his Rotax DD2 Masters crown in Brazil come December, his odds shortened considerably after this afternoon’s 22 lap masterclass. The Victorian took his third round win of the four this season – crossing the line 5.9 seconds ahead of one of the battles of the year. Jason Pringle nabbed second place after having to fight his way through a heavy pack which included Kris Walton, Troy Bretherton, Matt Wall and Scott Howard. Walton was an early race casualty, pulling in after a technical drama on the eighth lap, this led to a thrilling battle that became a race in three for the minors right at the very end. With Scott Howard unable to take up the fight, Troy Bretherton tried desperately to elevate his Pacific Kartsport Formula K to the podium in a nod to his karting mentor, Dale Verrall – who will cease to operate under the Pacific Kartsport banner following this event. In the end though, Pringle hung on for second by 0.05 of a second from Wright with Bretherton having his best performance of the year in fourth, followed by Wall. 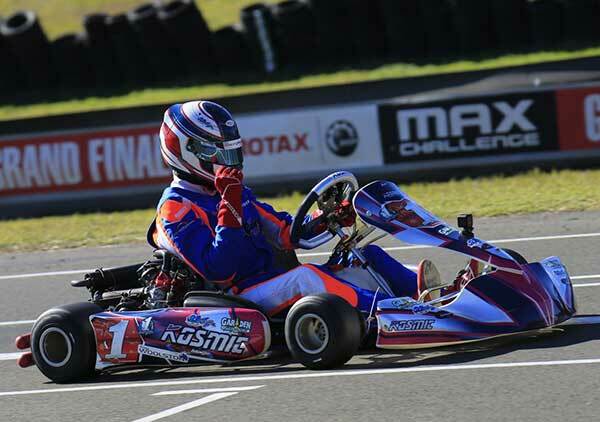 Goulburn (NSW) second generation racer, Costa Toparis has emerged as the leading sub-Junior driver in the Rotax Pro Tour in the Mini Max category, emerging victorious for the third time this season. Toparis got away early from the pole, aided by an early race battle between Ethan Feather and Cody Maynes-Rutty, which allowed the momentum to shift to the New South Welshman. Feather was able to escape the clutches of Scuderia PCR’s Maynes-Rutty to get into second position. He then had to cut down Shayne Piper Race Engines driver, Toparis’ lead of over one second. A strategic battle ensued with Toparis protecting the lead and Feather trying to repeat his last round chase down. While getting the lead down to under 0.7 of a second, Toparis had Feather’s measure and extended his Rotax Rankings points lead. Maynes-Rutty scored a hard fought podium on home soil, emerging on the podium after a battle with Plus Fitness/Monster Energy driver Jack Childs that lasted the entire back end of the race. Jaiden Pope survived a three way battle in Junior Max to extend his lead in the Junior Max points standings, whilst the fight for the final place on Team Australia will have tightened up after a DNF from Luke Pink – who was second on points coming into the weekend – and an outstanding weekend from third placed man on points – William Seal. Kosmic TWM pilots, Pope, Seal and Beau Pronesti had a race long battle – all three locked together right throughout. Pronesti – in his best Junior Max showing – was shadowing Pope and at several stages looked as though he may have pulled a home race win. Nevertheless, Pronesti was forced instead to yield to Seal who got through late in the race to take second. The result moves Castrol-backed Seal – who turned 14 yesterday – forward in the points and it was Pronesti’s first ever Pro Tour podium. Last round winner, Ryan Wood was a distant fourth just in front of Eastern Creek regular Bailey Hazard. The irrepressible Lane Moore pulled off one of his best Pro Tour wins today. After a self admittance of being off the pace all weekend, the Team CRG Australia driver got to the lead off the start and didn’t look like being headed. Moore inherited the pole after the Pre-Final – which saw Zac van Leeuwestyn cross the line first, however receive a post race startline penalty. Moore drove away at the front before all hell broke loose behind. Mitchell Wall was the first major casualty, being shuffled down the order then involved in an accident with other competitors. Moore was building an advantage at the front while van Leeuwestyn was by far the fastest driver on track. He was carving his way through the field and soon came across the fight that included Ben McMellan, Tony Bregonje and Alexander Rinaldi. McMellan had to leave the fight after his sidepod came adrift going down the back straightaway, this left it between Bregonje and Rinaldi – with van Leeuwestyn setting quick laps all the time. It didn’t take long for the Novocastrian to get past the two in front and then set eyes on a bigger fish – Moore. With nearly two seconds up his sleeve, Moore looked comfortable, but the tenacity of van Leeuwestyn was not to be denied. He put in lap after lap of blistering lap times to start the final lap in contention! He pushed hard, and got within striking distance of Moore, however the Gold Coaster was too good taking his third round win of the season by 0.39 of a second. Top Gun Racing Academy driver, Rinaldi emerged third over Adam Hunter Race Engines-backed Bregonje. In Micro Max, Jake Rutkowski extended his Series lead with a dominant win. The Shamick Racing driver got to the lead early as chief rival, Sera Driver Development’s Peter Bouzinelos ran wide on the opening corner, which placed him at the back of the field. It didn’t take long for Bouzinelos to carve through the field, however the Rutkowski horse had bolted. He would take a 5.7 second win over Bouzinelos, however the battle for the minors was entertaining. The three Z Corse drivers – Max Walton along with eight-year-old twins Jenson and Jaxson Burns all had turns inside the top two and three throughout the course of the race. James Anagnostiadis was right in the battle as well. The quadrant swapped places for much of the latter half of the race, however it was Jaxson Burns who emerged on top over Jenson, Walton and Anagnostiadis. The Rotax Pro Tour now goes into hiatus until August 10-12 when it hits Albury Wodonga for the penultimate round of season 2018. 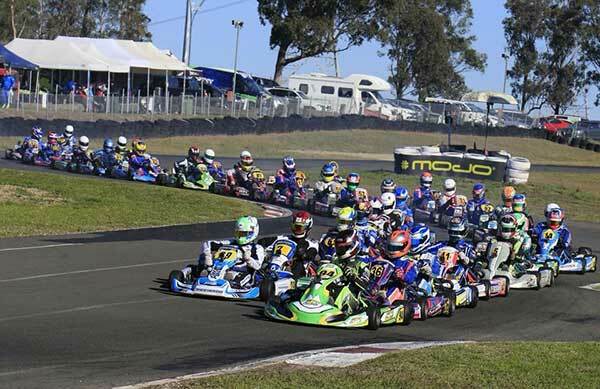 The visit to North Shore Kart Club once again delivered outstanding racing and some surprises as the road to the Rotax Max Grand Final Challenge continues. On demand video footage of today’s Pre-FInals, Finals and Presentations can be viewed at www.facebook.com/rotaxprotour.